The Canary Islands are the islands described in the myths and legends of ancient Greece as a paradise : for Homer they were the "Elysian Fields", for the poet Hesiod "Blessed Islands", for Plato the lost continent of Atlantis. 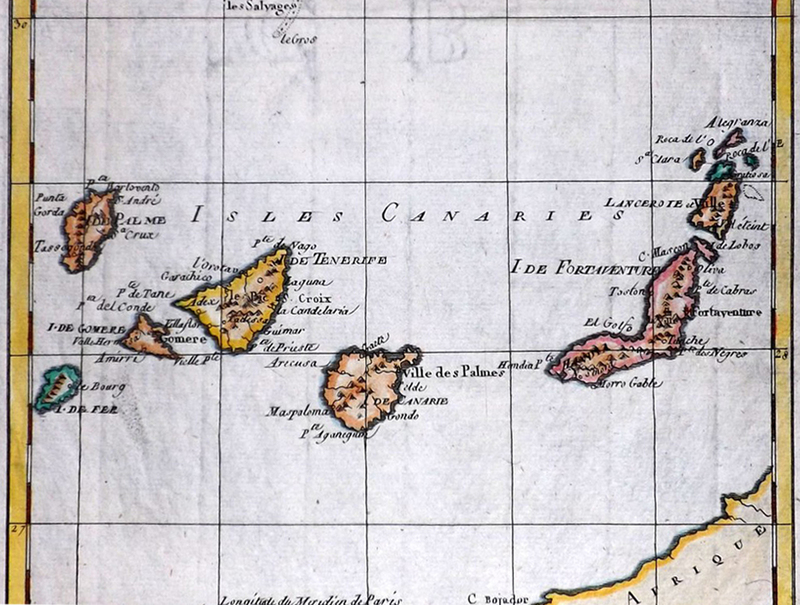 The Canary Islands are part of Macaronesia that has the same etymology: the Islands of the Blessed, the Greek words μακάριος, "happy, blessed" and νήσοι, "islands". Early in the first century AD, the Roman historian Pliny the Elder calls "Hesperides Islands" (Insulae Hesperidum). The place name "Canary" means "Islands of Dogs" : at the end of the first century AD, the nephew of Pliny the Elder, historian Pliny the Younger, reports in his book Naturalis Historia, that around 50 BC the king of Numidia and Mauretania, Juba II sent an expedition to explore the islands; discoverers observed for the presence of large fierce dogs. 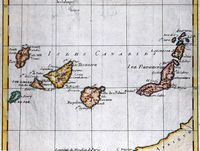 Pliny named the islands “Canariae Insulae” (from the Latin can, canis: dog). 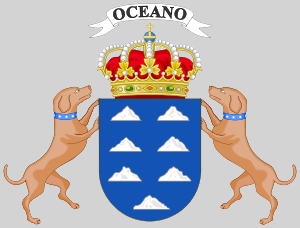 The crest of the archipelago has two dogs symbolizing the two Canary provinces. The Romans named them later the "Fortunate Islands" (Insulae Fortunatae). The archipelago of the Canary Islands in the Atlantic Ocean, 115 km off the Moroccan coast. It is part of Macaronesia which also includes the archipelago of Madeira, the Azores and Cape Verde. Go to page Geography of the Canary Islands. Go to the History page of the Canary Islands. Go to page Tourist information on the Canary Islands. If you reached this frame directly, click on this link to reveal the menus..